The Montegrappa Alexander Hamilton Ediiton is available in a choice of 2 finishes and 2 writing modes. Prices start at $2,850. Please click on the drop down menu to choose the available options and price adjustments. Alexander Hamilton has long been considered to be one of the foremost of American Founding Fathers. Born in 1757 on the Caribbean island of Nevis, he moved to New York as a teen to further his education. Hamilton took an important role in the Revolutionary War as senior aide to General George Washington, and after the war was elected as a representative to the Congress of Confederation. Hamilton was known for being in favor of a stronger central government. He was instrumental in influencing Congress to issue a call for the Philadelphia Convention in order to create a new constitution. One of Hamilton’s most important contributions was the primary authorship of the Federalist Papers, considered to be an indispensable document for interpretation of the US Constitution. Hamilton was a nationalist who emphasized strong central government and successfully argued that the powers of the Constitution provided legal authority to fund the national debt. Hamilton served as the first Secretary of the Treasury and was instrumental in the creationof the US Mint. He was also fundamental in the development of friendly trade relations with England, and strongly supported the creation of a government backed Bank of the United States. Hamilton continued political, legal and business activities in New York City, and was active in ending the legality of the international slave trade. Hamilton opposed the election of Aaron Burr in 1804. Burr took offense and challenged him to a duel, mortally wounding Hamilton. The Montegrappa Hamilton Edition is an exquisite example of the pen maker’s art. Bringing together the finest Italian craftsmanship with a unique design featuring precious metal accents and two versions of striking artwork displayed on cap and barrel. Limited to 177 fountain pens and 177 rollerballs in each version, the Montegrappa Hamilton features depictions of Hamilton on the barrel, one a hand painted version of John Trumbull’s 1805 portrait, the other based on the portrait introduced in 1928 for use on the US $10 note. The caps feature a depiction of Hamilton’s writing. The fountain pen is fitted with a classic 18K solid gold nib featuring the initials “AH” engraved on its surface, and the rollerball a section crafted of sterling silver. Each Hamilton Edition features detailed sculptural elements in sterling silver at cap top and barrel end as well as an intricate cap band. All are set off with rich vermeil accents. The Hamilton Edition is topped with a gleaming rose gold representation of the flame from atop the torch of Statue of Liberty. The Montegrappa Hamilton Edition is a striking and elegant celebration of one of America’s most instrumental historical figures as well as a one of a kind opportunity to own a magnificent fine writing instrument. Fountain Pen utilizes the piston filling mechansim. Among the greatest of the Founding Fathers of the United States of America, Alexander Hamilton (11 January, 1755 or 1757 – 12 July, 1804) was notable for achieving so much despite a difficult childhood and dying at a too-young 49 years of age. Though he never attained the highest office of the newly-formed nation, few of his fellow founders would influence its political system more than Alexander Hamilton, and few were more controversial. As is now well-known, Hamilton had much to overcome in his youth. He was born out of wedlock in Charlestown, Nevis in the British West Indies. His Scottish-born father, James A. Hamilton, was the fourth son of Alexander Hamilton, laird of Grange, Ayrshire, and his mother, born Rachel Faucette, was half-British and half-French Huguenot. Compounding this, Hamilton was orphaned as a child by his mother’s death and his father’s abandonment, but he was taken in by an older cousin and later by a prosperous merchant family. Recognised for his intelligence and talent, and sponsored by a group of wealthy local men to travel to New York City to pursue his education, Hamilton attended King’s College (now Columbia University), choosing to stay in the colonies to seek his fortune. He discontinued his studies before graduating when the college closed its doors during British occupation of the city. Hamilton played a major role in the American Revolutionary War, joining a militia at the start of the war, in 1775. Early the following year, he raised a provincial artillery company, to which he was appointed captain. He soon became the senior aide to General Washington, then the American forces’ commander-in-chief. Hamilton was dispatched by Washington on numerous missions to convey plans to his generals. After the war, Hamilton was elected as a representative from New York to the Congress of the Confederation. He resigned to practice law, being among those dissatisfied with the weak national government. He led the Annapolis Convention, which successfully influenced Congress to issue a call for the Philadelphia Convention in order to create a new constitution. Hamilton was an active participant who helped achieve ratification by writing 51 of the 85 instalments of The Federalist Papers which remain the single most important reference for Constitutional interpretation. Hamilton became the leading cabinet member in the new government under President Washington. He was a nationalist who emphasised strong central government and successfully argued that the implied powers of the Constitution provided the legal authority to fund the national debt, assume states’ debts and create the government-backed Bank of the United States. These programs were funded primarily by a tariff on imports and a highly controversial tax on whiskey. To overcome localism, Hamilton mobilised a nationwide network of friends of the government, especially bankers and businessmen, which became the Federalist Party. A major issue in the emergence of the American two-party system was the Jay Treaty, largely designed by Hamilton in 1794. It established friendly trade relations with Britain, to the chagrin of France and the supporters of the French Revolution. Hamilton played a central role in the Federalist party, which dominated national and state politics until it lost the election of 1800 to Jefferson’s Democratic-Republican Party. In 1795, he returned to the practice of law in New York. Hamilton envisioned a strong central government led by avigorous executive branch, a strong commercial economy with a national bank and support for manufacturing, and a strong military. His position was challenged by Thomas Jefferson and James Madison, who formed a rival party as they favoured strong states based in rural America and protected by state militias as opposed to a strong national army and navy. Controversy was never far from Hamilton, with Jefferson and Madison denouncing him as too friendly toward Britain and toward monarchy in general, and too oriented toward cities, business and banking. In 1798-99, Hamilton called for mobilisation against France after the XYZ Affair and became commander of a new army, which he readied for war. However, war was never officially declared and did not involve army action, though it was hard-fought at sea. President Adams found a diplomatic solution that avoided a war with France, so Hamilton’s opposition to Adams’ re-election helped cause his defeat in the 1800 election. Jefferson and Aaron Burr tied for the presidency in the electoral college in 1801, and Hamilton helped to defeat Burr, whom he found unprincipled, and to elect Jefferson despite their philosophical differences. Hamilton continued his legal and business activities in New York City, and was active in ending the legality of the international slave trade. Vice-President Burr ran for governor of New York State in 1804, and Hamilton crusaded against him as unworthy. Burr took offense and challenged Hamilton to a duel. Burr mortally wounded Hamilton, who died the next day. Montegrappa has honoured Alexander Hamilton with two distinguished pens, the collection imbued with highly-detailed surfaces and fittings, to embody the various aspects of his personality, life, deeds and merits. Both are offered as fountain pen and rollerball, is limited to 177 fountain pens of each type, and 177 rollerball pens for both models. The fountain pen is piston-fed, and the nib is made in 18k gold with the initials “AH” engraved on its surface is offered in a choice of Extra Fine, Fine, Medium or Stub grades. The Ivory White Resin edition is enriched with Sterling Silver trim, as well as a plethora of lost-wax casting details that vary from shiny silver, to plated yellow and rose gold. Its decorative ornamentation has been inspired by the US $10 banknote, with contrasting laser engraving on the pen barrel depicting a facsimile of the US $10 bill, bearing his portrait. Its cap is engraved with a quote from a hand-written note, featuring his signature. For the Black Resin version, rather than the $10 note, the barrel features a full-colour reproduction, hand-painted with enamels, of the famous portrait by John Trumbull. Both editions’ pen cap tops represent the torch of the Statue of Liberty, the die-cast ornamental decoration resembling the flames of the torch, with 18k rose gold plating signifying fire. The signature clip and blind cap as a dome were all inspired by the Statue of Liberty. The art of penmanship or writing is for those, who feel the need to connect heart to heart, soul to soul through the fountains of rapturous emotions and deeds that continue to live after us. And it is only for such that a fine writing instrument takes pride of place to cherish the noble art of writing. It is indeed for the connoisseurs of such art that Montegrappa creates pens that are reserved to cherish the emotions inspired by the feel of a beautifully crafted writing instrument, bringing back the stories of the land known for drama and love, and prolific writers, who have penned innumerable masterpieces that are a testament to the strife for all things beautiful. 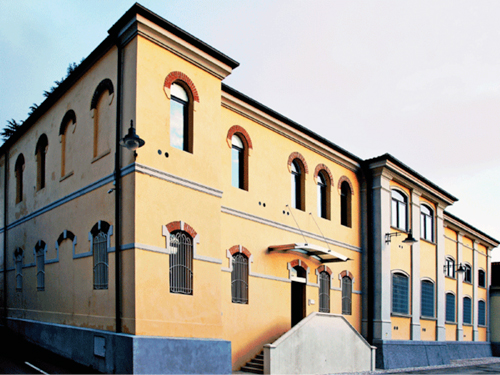 The Montegrappa manufacture since 1912 stands in the same historic building on the bank of the River Brenta, in one of the most picturesque areas of the historic town of Bassano del Grappa, in the prosperous northeastern part of Italy. Born out of the war struck area of Bassano, which was a major war zone during World War I, Montegrappa, established as a manufacturer of gold nibs and fountain pens, soon became the chosen one for many soldiers stationed there to write back home. A child of the country's turbulent emotional struggle, Montegrappa and its writing instruments are a part of history and those who have made history such as Vladimir Putin, Benito Mussolini, His Holiness John Paul II, Michael Jackson, Paulo Coelho, Michael Schumacher and more. Whether it is the colours reminiscent of the master painters or the ornaments of Baroque palaces, Montegrappa's collections are inspired by great moments of history and the most ancient passions of mankind. "Italian heritage and pride is at the heart of all of Montegrappa's work," Giuseppe Aquila, CEO, Montegrappa, proudly mentions. The company is named after the mountain on which the Italians made their final stand and successfully repelled the Austrian and German forces during the World War I and therefore, represents the fighting spirit and heroic acts of valour of the brave Italian soldiers. The Grappa Massif, the range of mountains with the Monte Grappa at its peak, was the last strategic position before the plains of the Veneto region, and had 25,000 Italian soldiers not laid down their lives in the defence of their country, a lot would have been lost. This region of North East Italy, between Vicenza and Venice is extremely rich in metal working and handcrafting traditions, handed down through generations. Montegrappa, located in Bassano del Grappa, directly under the Monte Grappa mountain, is in the heart of this important region and benefits from a great wealth of talent and resources. Speaking about the inspirations at Montegrappa, Aquila is quick to add, "Most often we take inspiration from the wealth of beautiful and cultural riches that we have in Italy, but we increasingly are inspired by ideas and themes from our international customers, who ask us to design products based on concepts from their regions. We take it as a great source of pride that people from all over the world have come to appreciate Montegrappa's unique capabilities to take an idea from concept to design to final production." One cannot help, but see the prolific use of varied manufacturing techniques and exquisite materials used in Montegrappa pens that truly make them one-of-a-kind and elevate them as superior pieces of art. As the only existing company to have the ability to process materials such as celluloid and ebonite that require a specific know-how, which has been developed and preserved over 100 years of history, the brand also brings out the best through other unique technologies like deep-drawing and low-relief engraving. Montegrappa also goes down as the first pen company to introduce the jewellers' technique of lost wax casting in the writing industry and one of the few to have a skilled team of in-house engravers, enamellers, stone setters and miniature painters. "We at Montegrappa are proud to be able to say that we do not really face any direct competition as there is no one who is able to do the sort of work that we do. 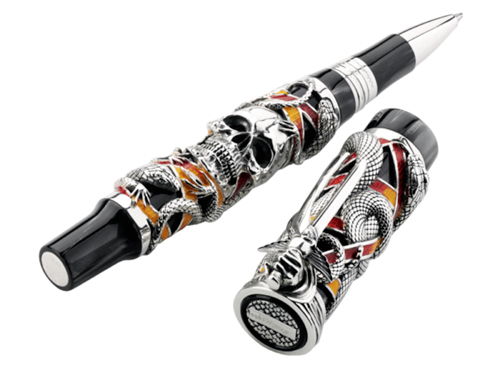 On some technical levels, our pens are superior to other pens in the luxury writing instrument category, where we have preserved some techniques and use of materials that other manufacturers have abandoned in favour of cheaper, modern alternatives, such as the use of celluloid in parts of our pens, and the use of real carved ebonite for the ink feeders. These are some differentiators, however, the real difference comes from the unique talent pool that we draw from our region, giving us design and style that is truly special," adds Aquila. What started from scratch, quite literally, as a manufacture for making only fountain pens and nibs, a specialised area, and is still renowned as the best, they have seen a very successful diversification in recent years, with the introduction of watches, men's accessories and jewellery, leather goods, and most recently, a collection of fragrances. However, not losing focus on the writing instrument business, the brand continues to develop their core area of limited edition products that they are well known for. "While our design ideas and inspirations used to be drawn from classical arts and literature, we have more recently started to also develop some limited editions dedicated to more mainstream iconic figures in contemporary history, such as the great Muhammad Ali, Bruce Lee and Frank Sinatra," Aquila further elaborates. The most important question that comes to mind when on the topic of writing is how does a fine writing instrument fare in this age of technology and e-mails? To answer this, Aquila explains, "We are often asked this question. As we get more sophisticated gadgets and devices, it would seem that the need for a traditional pen is disappearing. However, we are surprised and pleased to find that the opposite is true. As people are getting more used to sending e-mails and text messages, a handwritten note is a great differentiator and really stands out, and is a good way to actually engage someone's attention when they are being bombarded with an onslaught of electronic and completely impersonal forms of communication. We also find that writing by hand is not a need, but a joy and an art, which can be greatly fulfilling and gratifying." Explaining further, he mentions how recent research in brain science shows that the human brain greatly benefits from the neural connections that are created when a person combines the act of putting their thoughts into words with the motor skills required to write by hand. "In fact, this entire subject and field of study fuelled one of our recent creations, the Limited Edition Brain pen. This pen was launched several months ago and comes with a book on the subject written by Dr. Richard Restak, one of the world's leading brain scientists." Cerebral and avant-garde, it is such conviction that goes into the creation of their pens and shows how the renaissance of handwriting remains ubiquitous in the objectives of Montegrappa. 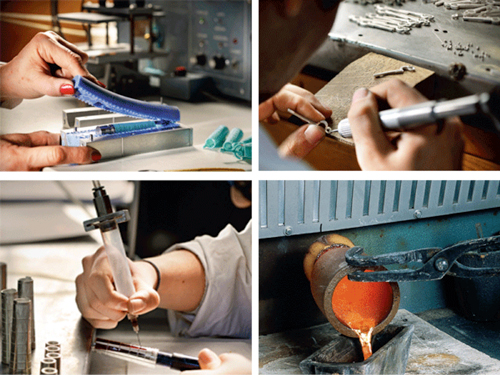 At Montegrappa, each project has a different story and involves different people, especially in the creative part. "I'm personally involved in the creative process and so is my brother and at times my father too. The first step is the idea. In many cases, the idea comes from me or might be suggested by some of our distribution partners. At times, some of my ideas are out-of-the box and the first reaction of my family and our partners is a bit sceptical. The idea is important, but equally important is the ability of expressing such an idea through a product, and in our case a pen," Aquila expresses. What follows is the second step of putting the idea to paper and trying to encapsulate the concept attached with the idea. Working with in-house designers or at times even with external designers to gain experienced opinions about a specific theme is what brings that added edge to their pens. For all projects, they run extensive research and often employ the services of historians, art experts and intellectuals to make sure that the design not only looks good, but is correct under every aspect. Going ahead with the engineering process, the brand has a strong team of 10 in-house designers and engineers, who use very sophisticated 3D modelling software to design the different components. The prototyping stage is taken care of by a separate team using dedicated machinery and equipment which leads to the pre-series, a small production run required for quality control. From quality control, it enters the final manufacturing stage to the final product. Speaking about the challenges in the world of fine writing instruments, Aquila once again reminds us that Montegrappa has always been a pioneer in the writing industry. "One of our main skills is the ability to adapt to the fast-evolving market and re-invent ourselves every day. The challenge is to remain true to the original spirit of the brand and at the same time always be at the forefront of the industry." From heads-of-states, royalty, popes, musicians, actors, sportsmen, writers, artists, celebrities, and top models who share unanimous love as distinguished patrons of Montegrappa pens, the brand has created several limited edition pens featuring unique designs focusing on the life and achievements of various celebrities. "We have been very fortunate that we have had some celebrity customers who have become great friends of the brand and have come to be ambassadors of Montegrappa, through their love and appreciation of our products. Some have been such great lovers of the brand that they actually wanted to be part of the company and have made investments in Montegrappa and are shareholders, such as Sylvester Stallone and Jean Alesi. And there are some who appreciate our works of art and have asked us to make special pieces for them, either as bespoke unique pieces, or as a limited edition product such as the Chaos pen by Stallone, or the Alchemist pen for Coelho. 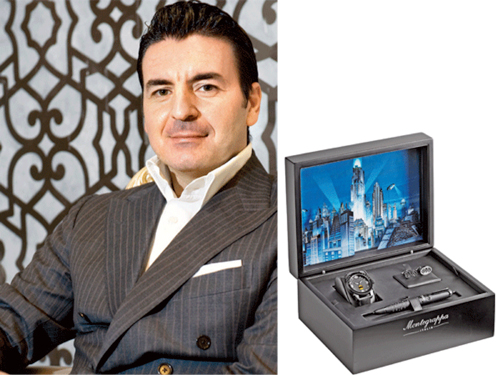 So in reality, the personalities typically choose Montegrappa, rather than the other way around," Aquila explains. With such a strong philosophy and cerebral backing, the brand's effort in ensuring the longevity of the art of writing, the power of fine penmanship and a highly personal intimate indulgence is surely here to stay. I love the connection Montegrappa makes with American history and Alexander Hamilton. It is amazing how the artisans from Bassano del Grappa can paint such a wonderful depiction by hand right onto the barrel and cap of the pen! This is definitely a unique piece of art. It is a great writer too!